That was Emperor Jahangir recounting his hedonic capers in ‘Tuzk-i-Jahangiri’. He was taking a break at the delightful way station while on his way to Kabul in April 1607. Earlier, his father Emperor Akbar and later, his son Emperor Shah Jahan had been frequent visitors to this rest-and-recreation spot, where the watchwords were opium, wine, hunting and fishing. Today, the dilapidated relic known as Wah Gardens continues to be a relished picnic spot for locals and for whom, carbonated beverages and fowl-rich biryanis provide the ultimate high. I had visited the gardens several times when we were young students at the nearby Cadet College. For those of us whose parents were located too far for a weekend visit, cavorting in the local bazaars and verdant gardens of Hasanabdal provided welcome relief from chronic homesickness. Now, four decades later, nostalgia of another kind took me back to Hasanabdal. The aroma of spicy fried rohu fish sold by street side vendors, verdant loquat gardens even now too tempting for a mischievous raid, the all-pervasive whiff of bhang that grows ever so wild and, every other restaurant dedicated to Lalarukh, whoever she was: these were sights and smells that had to be savoured to relive those teenage years long gone. About three kilometres south of Hasanabdal near the small bridge over an anaemic Dhamrai Nala, a narrow road branches off into dense foliage. On the roadside is a romantic little cottage surrounded by a bamboo thicket, which I recall, was once owned by an old German lady. Winding around acute corners of villas of the well-to-do locals, one suddenly finds himself face to face with the ever-present extortionist, greedily waving the carparking coupon. The gardens seem abuzz with activity and revellers of all ages greet outsiders with the usual small town stare. Rs15 entrance ticket allows you inside the gardens. In the middle of the green lawns is the fish pond described by Jahangir, but instead of fish of the half gaz variety one sees dozens of mammals of the two-legged kind, clad in all-purpose shalwars, thrashing about in the water to kill the intense summer heat. Alongside, families have laid out their feasts on mats under the cool shade of some very old chinar trees. A nearby marble plaque proclaims: Chinar, Platanus orientalis, 1908. Besides the pond, the upper terrace also has a pair of utterly ruined baradaris, the only extant buildings in the gardens. Traces of an adjoining royal hammam are also visible. The lower terrace has a central water channel (now dry, of course) lined with elegant cypresses. At the northwestern end of the channel is the main entrance gateway, which is closed to the public. “Time has left nothing but ruins of buildings, parterres covered with grass and weed-choked reservoirs, a jungle of trees….” wrote a certain Colonel Cracroft in 1932. Today, eight decades later, it is not much different from the Colonel’s description. Unhappily, one is left wondering what the gardens must have been like in their original imperial splendour. For those of you who thought that something was amiss about Mughals on an R&R trip, we shall move to another part of Hasanabdal to see if it connects. Turning into the Main Bazaar Street, one comes across the familiar Sikh Gurdwara of Punja Sahib. It is out of bounds for Pakistanis — which is no surprise, as things are — but that doesn’t matter if you are looking for a certain Lalarukh’s tomb that lies just across the street reeking with open drains and bubbling sewers. 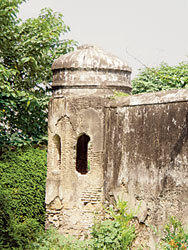 In the centre of a small chahar bagh style walled garden, stands an odd squarish structure made of rough stone blocks crudely plastered, standing about two metres high. The somewhat stubby corner turrets of perimeter walls are topped by small ribbed domes, hinting at vestiges of a Timurid tradition. A later day cenotaph surmounts the pedestal rather loftily; there is no tombstone, no sign of the forlorn occupant of this strange tomb. Lalarukh, or ‘tulip face’ is supposed to rest here according to lore, but she remains one of the enduring mysteries. Mughal genealogies or autobiographies do not record any princess by the name of Lalarukh. In any case, if she were a royal daughter accompanying the emperor and, died due to an accident or some natural cause, a splendid tomb would surely have been ordered. Could she have been a favourite concubine who accompanied the emperor as he tarried at Hasanabdal on his way to Kashmir or Kabul? Perhaps she contracted some tropical fever in the hereabouts and, was quietly laid to rest amidst the cypresses and cool streams, far away from the court chatter of Agra, Delhi or Lahore. On the other hand, she could well have been a local courtesan who knew how to liven up the emperor’s evenings with song and dance. As for the emperor who might have been associated with Lalarukh, all three mentioned earlier were consummate pleasure seekers; however, if the famous Anarkali offers a hint, it could well have been the unstoppable Jahangir! Just when it seemed that some headway had been made in this right royal tangle, we have one Hasan Gujjar who is claimed by traditionalists to be the real occupant of the mystery tomb. Why a Mughal emperor would edify the Gujjar’s resting place with a garden and a tomb and, not mention it in his autobiography when even the most mundane activity gets detailed, is inexplicable, unless one of the emperor’s nobles undertook the initiative on his own. One of our professors at the Cadet College, the late M H Siddiqui, who was well-versed in local lore and history, was of the opinion that Hasan Gujjar was none other than the saintly Sheikh Karim-ud-din Baba Hasan Abdali. What is known for sure is that ‘Lalla Rookh’ is just a fictional character in Thomas Moore’s grotesquely amusing 19th century romantic poem, hung around the neck of Emperor Aurangzeb’s misnamed daughter. How she ends up in Hasanabdal, remains an unsolved riddle. Perhaps someone in the British Raj thought that Moore’s imaginary princess had just the right credentials to fill in for the unknown courtesan or the Gujjar — and, could help attract odd tourists like me! 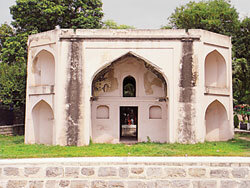 The tomb’s basic form is derived from a regular square with bevelled front corners. Archways on the four sides lead to the tomb chamber, which is vaulted on the inside. The archways, as well as the exterior and interior walls, have niches which break the monotony of the simple structure. Unfortunately, crumbling plaster and graffiti scribbled through the ages have rendered this building in as wretched a state as the rest of the Mughal buildings in Hasanabdal — and much of Pakistan, I hasten to add. It is said that the ruinous condition of the tomb is largely due to the wanton destruction of Muslim buildings by the terrible Hari Singh Nalwa, Sikh Khalsa Army Commander and later Governor of Peshawar under Maharaja Ranjeet Singh. The cenotaphs of the Hakim brothers were razed, all embellishments removed and the tomb was used as a munshi’s office for a long time. Apparently, no worthwhile renovation has been undertaken since then. A fishpond in front of the Hakims’ tomb is full of slimy water with hideous flotsam, including polythene bags and juice packets, floating about. The wonder is that many large-sized mahasher fish swim about, apparently in good health! The next time the Archaeology Department decides to hold its annual seminar, Hasanabdal might be good venue to set up camp. Maybe it gets the archaeology mandarins’ attention for a long due repair job at this — once celebrated — way station of the Mughals. “You must be mad...they’ll kill you before you’ve gone ten miles. You’ll never get a visa and even if you do the visa people will tip off their relatives who will rob you and cut your throat half an hour after you pedal off down the road.” Thus spake Spiros, owner of the campsite on the Greek island of Corfu from where I planned to start the Great Albanian Expedition. At that time there was no direct flight to Albania for tourists, and you had to enter by sea using a ferry from Corfu town. Easy-peasy, thinks I. So I had flown to Corfu with the bike and was expecting nothing more than the usual occasional puncture and a little hard pedalling up some rough roads in Albania. You will get nothing but smiling hospitality said my friends at the Albanian Society. Wonderful people. Generous to a fault. I had not expected to get a dire warning as to my imminent demise even before setting foot in the place. The following morning, having risen bright and early, packed my tent and bags and cycled into a sparkling dawn, things took a downwards turn as I joined the ferry queue that would take me across the water to the tiny port that served Butrint, the Albanian town of historic importance where I intended to spend my first night. “You are going to cycle in Albania?” says the ferrymaster. “You’ll be dead in an hour.” I point out that my friends in the Albanian Society had told me that Albania was a wonderful place, virtually free of crime and happy to welcome visitors bearing dollars. The ferrymaster then explained to me in painstaking detail the virtual collapse of civilised society in the last few months and painted a picture of Albania that was not unlike Mediaeval Europe but without the luxuries. There were roaming bands of feral gypsies that waylaid travellers, no safe campsites and hotels were non-existent. The roads were appalling, there were massive food shortages and the public transport system had broken down completely. Undaunted but a little crestfallen I boarded the ferry and we went across the strait in a haze of shades of blue, the Ionian at its most beautiful and serene. Albania emerged from the mist, rolling sere hills, small settlements... looked fine from a distance. We docked, and I started the Great Visa Hunt. Cutting a long and slightly unhappy story short the Albanian customs officers in the end decided that the safest thing to do was confiscate my bike, bags and passport all in the interest of protecting me from an untimely end. So they did. And I was left on the quayside bikeless and wondering what to do next. “Would you like to do a day tour of Butrint?” said a small voice. It was a man accompanied by a rather frightened looking group of Americans who, like me, had made the mistake of listening to those who knew Albania from a time before the one we stood in, all of uncertain future. We duly took the tour of Butrint. Fascinating, and today one of Albania’s leading tourist destinations. In late afternoon the customs gave me back my bike, bags and passport and we left for Corfu town. I cycled into the campsite a couple of hours later and Spiros laughed fit to bust. “Have a drink, Mr Chris, this one is on me.” And I never did get to cycle around Albania.